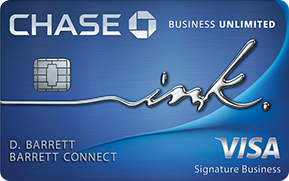 The Chase Ink Business Unlimited card is a great option for business owners who want a no annual fee cash back credit card. Earn unlimited 1.5% on all purchases without restrictions on categories. Ultimate Rewards can be redeemed for cash back or transferred to select cards for travel. Review: Is the Chase Ink Business Unlimited Worth It? The Chase Ink Business Unlimited earns 1.5% cash back on all purchases so you don't have to worry about keeping track of category spend. The card is ideal for businesses that have a high amount of non-category spend like marketing ads, hardware supplies, or bills. Even though the points earned on the Chase Ink Business Unlimited are advertised as cash back, you actually earn Ultimate Rewards. The Chase Ink Business Unlimited shines when you pair it with the Chase Ink Preferred to redeem Ultimate Rewards points for travel. Get 25% more value when you pool points together for travel using the Chase Ultimate Rewards Travel Portal. Ultimate Rewards points earned on the Chase Ink Business Unlimited card can be transferred to the Chase Sapphire Preferred, Chase Sapphire Reserve, or Chase Ink Preferred card for higher travel redemption. Depending on the cards you have in your wallet, Ultimate Rewards (UR) points earned from the Chase Ink Unlimited can be redeemed at 1.0-1.5X. The optimal strategy is to transfer the UR points to the Chase Ink Preferred, Chase Sapphire Preferred, or the Chase Sapphire Reserve and redeem for travel.